Mullvad has clients for three mainstream platforms supported OpenVPN offering anonymity across 182 servers in 58 cities. The service offers a one-month plan and accepts all sorts of payment including Bitcoins with unlimited bandwidth and data usage using AES-256 encryption protocol. Zero logging and email-only support are added features offered by Mullvad VPN. Mullvad review concluded that it has limited servers in limited regions with no clients for Android and iOS and offers just one plan at no yearly discount. You may not be able to entertain Netflix with Mullvad, but you can sleep well as the company is there to look after your privacy and security. From its physical servers to its no logs policy, to keeping minimum cookies, to its Swedish base and everything reflects confidentiality and anonymity. Mullvad VPN supports P2P capabilities for you to torrent your heart’s content with no long-term commitment. 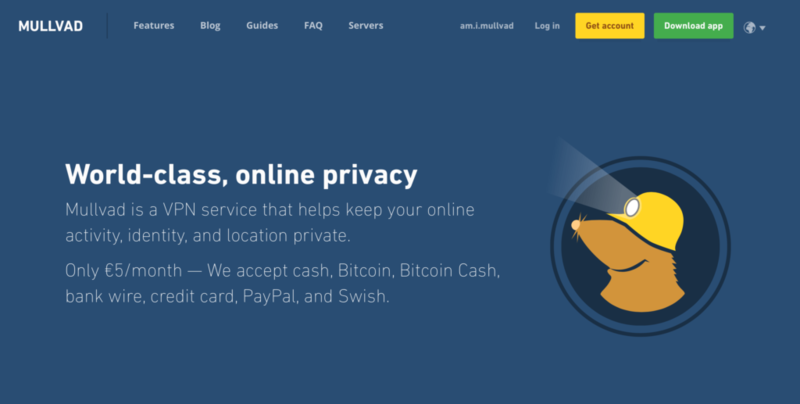 Mullvad, a Swedish-based VPN that not only boasts online privacy but does something to protect it; that’s why has a prominent position in the market. It’s relatively a secure and easy-to-use yet affordable VPN offers a monthly package with three-hour free trial, among the other mediocre VPN providers. This pricey yet technically sophisticated VPN service has high standards for privacy and gets you into Netflix, not always but most of the time from its decent geographic reach. Apart from zealously defending the confidentiality, Mullvad is also one of the VPNs with the broadest range of anti-censorship technologies. The best thing about Mullvad VPN is that it’s suitable for beginners, so you don’t need to be tech-savvy, and you won’t overwhelm with cryptic settings and a complicated interface. With 180+ servers in more than 32 countries across the world, offering anonymity with no-nonsense, robust security, and the reliable performance. If privacy is your thing, check it out. Read this Mullvad review and find a suite of features aiming to protect your online presence. Before moving forward, here is the general info about Mullvad. Where is Mullvad VPN based? Mullvad VPN is operated by a Swedish-based Amagicom AB, a cyber security company; a well-known in the Nordic region. 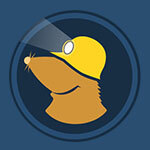 Mullvad, the Swedish mole – a perfect name for a privacy-minded VPN company. The company hosted 32 server locations worldwide including Australia, Canada, Denmark, Israel, Japan, Hong Kong, Netherlands, UK, USA, and some others. Sweden, being the country with less internet censorship and a relaxed copyright violation, VPN providers within Sweden don’t keep logs or abided by EU data regulations. However, we can’t forget the fact that Sweden is a part of the fourteen-eye countries, but thanks to the additional not-to-spy agreement, that these countries have signed. It is rare that VPNs get blocked, but it happens in restrictive places like China and Iran; to counter this, Mullvad allows you to run the VPN over almost any port. We recommend you to use OpenVPN traffic over Transmission Control Protocol (TCP) port 443; this port used by HTTPS, that secures websites. Without HTTPS, online commerce including shopping or banking is not possible. Therefore it’s rare for this port to be blocked. Few ports are blocked to address spam and security issues. To circumvent internet censorship, Mullvad has an open-source proxy application known as Shadowsocks, but lacks servers in China and Russia. Want to use Facebook and Google in China? Checkout our recommended best VPNs to use in China and access all geo-blocked websites. One of the biggest reasons we subscribe to a VPN is to bypass censorships and unlock streaming services like Netflix; the company known for its relentless crusade against VPNs. If you’re a heavy Netflix aficionado, scroll down to decide whether you should go with Mullvad or not. While testing circuit, we tried connecting to Netflix using several occasions and, unfortunately, we continuously received the dreaded proxy error every other time. This doesn’t reflect that the service is entirely blocked, so possibly you get different results. You will be notified as the service start unblocking US Netflix, so get ready to receive the green signal. Frankly speaking, this is not the case with Mullvad only, Netflix’s VPN detection mechanism is strong enough to block VPN-related IPs. 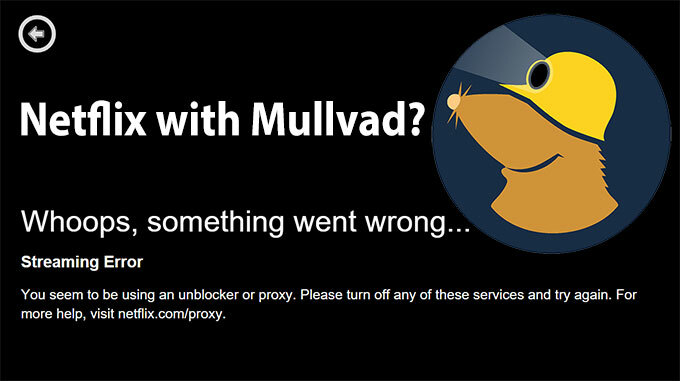 Mullvad is not the best option to give a spin if Netflix is your primary reason to have a VPN. If you want to use VPN to stream Netflix, then consider checking these VPNs that work with Netflix. Now that we have already highlighted some of the key elements that make a VPN standout in the market; it is time to talk about the features now in our Mullvad review. Just like other VPNs, Mullvad do have a lot of features that make the VPN company known in the market. We have spent time to check each of them in detail, so let’s check it now. More the servers, easier to connect to fast servers, no matter where you’re in the world; having more locations will give you more options in case you find a high amount of traffic on the connection. Mullvad VPN boasts 182 servers in more than 58 cities locating in 32 highly developed countries across the globe. It has a bunch of servers in the UK, the US, Sweden, and Canada; it’s pretty good, but no server in Africa and Asia with only one in South America. All the servers are owned by the Mullvad, not by any third-party developers. The rare thing we noticed while reviewing Mullvad VPN clients, is the secure yet non-breakable server switching; change servers without disconnecting from the currently connected one. Having servers in more than 30 countries is far better than some other VPN in the same tire, but is a far cry as far as the coverage is concerned, Mullvad lacks the widespread efficiency. If switching to TCP port 443 doesn’t work to evade censorship or didn’t hide the presence of a VPN, Mullvad has SSH and SSL (stunnel) tunneling for you. This is an additional layer of encryption that wraps around your VPN data. The DPI techniques cannot penetrate this “outer” layer of encryption; they won’t be able to detect the OpenVPN encryption present inside. Mullvad boasts Shadowsocks, a China-made open source anti-Great Firewall tool/protocol; connecting to its bridging servers of this special Socket Secure (SOCKS5) proxy; you can multi-hop your VPN connections. This also helps in complicating traffic analysis attacks. They are mostly used for P2P torrenting, either configure it manually on your BitTorrent client to get an added protection without using a VPN connection or use both SOCKS5 and VPN “double protection” while torrenting your favorite movie. Like other VPN services, Mullvad is adamant that the service is not interested in your cyber actions. Honestly speaking, not all services are not transparent enough, but given the lengths, Mullvad offers to help you anonymize your online presence, you will be inclined to believe it. From a privacy standpoint, Sweden is not an ideal region, and it also suffers some government surveillance issues; but thank God VPN providers are not bound to keep any logs. Mullvad also skirts EU logging policies as it isn’t an ISP, but don’t worry Sweden is not part of NATO, its security agencies historically happy to cooperate with counterparts in other Western countries. Connections, like when one is established or disconnects, duration, or timestamp, if any. 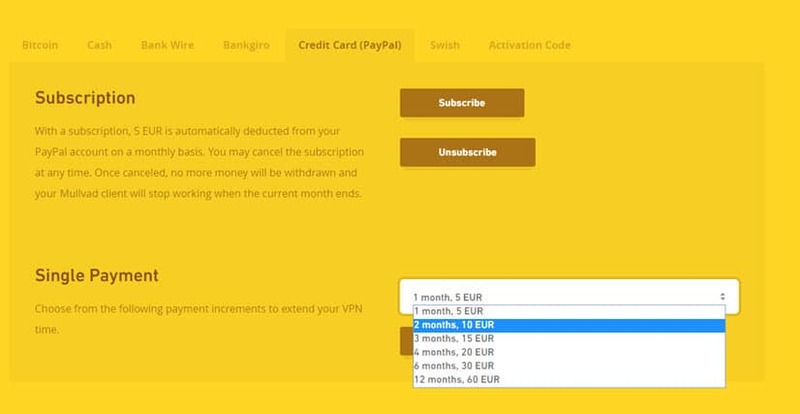 Account activity except simultaneous connections and the payment details. Isn’t great? This shows Mullvad’s commitment to privacy, but keep in mind that your real IP address is still visible no matter which VPN you’re using. 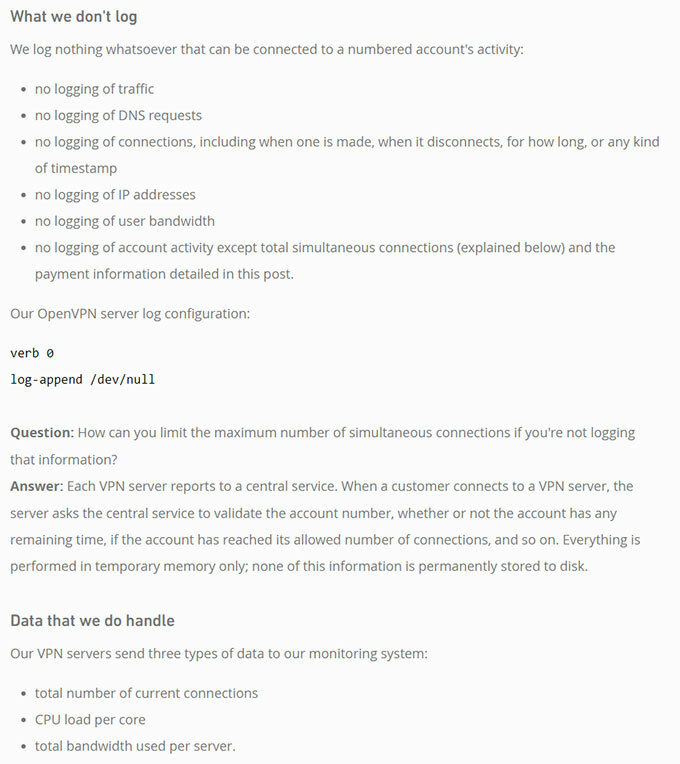 One thing is worth mentioning that Mullvad is relatively open about who owns and runs the VPN service; you’ll find their physical address of its parent company prominently on the website even the real names of their owners and team members. Mostly VPN overshadowed their privacy, but Mullvad has refreshing transparency, that’s inspiring enough to gain the trust among VPN seekers. We have reviewed some of the finest VPNs that take users’ privacy seriously. Check our post on best anonymous VPNs that offers foolproof security round the clock. Mullvad comes with a kill switch and runs its own PKI, using 256-bit AES encryption. While testing Mullvad, both at home and on the road, we found Mullvad, an unexceptional performer compared with other VPN services; it lagged behind in essential performance measures over the course of a month. However, it performed well in playing music and videos, regardless of our presence. Like most VPNs, you will not find a single local connection server in Azerbaijan, even we failed to connect to any server in Romania, but managed to find a reliable VPN link from dozens of their Swedish servers 2,500 miles away. Talking about speed, some Mullvad connections were lightning-fast, while others were running at turtle’s move. Unfortunately, Mullvad’s VPN infrastructure found to be one of the slowest that to an average speed of 17.6 seconds, to establish a connection. At worst, Mullvad’s average network latency took 111.7 milliseconds to transfer a single data packet from one endpoint to the other; 801 percent increase from the pretest baseline, means you have to waste you enough time between online requests. Let’s talk about data delivery; sorry Mullvad is not the best in this regard as well with an average download and upload speeds of 13.2 Mbps and 13.4 Mbps, respectively; 80 and 35 percent decline from the baseline measurements. Downloading a 780 MB video file with Mullvad, we found the slowest download speed of 1.04Mbps, that was a 67 percent drop from the baseline. We easily maintained a Mullvad connection across three devices simultaneously for 12 hours with three re-connections; that’s not unusual for a VPN service. Among all the VPNs we reviewed, Mullvad is the easiest to get started with, at least on a desktop; the signup process is quite unusual with no email address or password required. The website provides you a 16-digit number to sign in; quite creepy to remember the assigned number. Anyways, prove you’re human with a CAPTCHA, download and install the 12.5MB client application, pay for the subscription, and you’re in. Be it Windows (7 and up), Mac, iOS, Android or Linux devices, Mullvad is for all the mainstream platforms. The default Mac download is suitable for iOS Mavericks, and later, you have an earlier version, don’t worry! Mullvad’s archive has something compatible for you as well. But does all the versions are working or not? It’s uncertain and yes, it’s an indirect way to know which system you’re using. Download configuration instructions for the available routers including; pfSense, Asus Merlin, DD-WRT, OpenWrt, and Tomato. Generate an account number and download Mullvad’s software on your windows screen and start your 3-hour free trial. The client is simply stripped-down and works flawlessly with all the features you think you should have to protect online existence. Find the firewall-based DNS leak protection and kill switch with IPv6 connections tunnel in the Windows client; in case IPv6, not active means it’s disabled. The desktop app is bare-bones; like a reminiscent of Win XP era, but to be honest simplicity and functionality always win over fashion. The client is essential for beginners and has an abundance of manual customization if you’re tech-savvy. The client has dual tabs; status and settings; status tells you your connection (status, country, IPv4, and IPv6), connected server, and the software version you’re using. While the settings tab helps you change your account number and also manage your network settings like; ports, DNS leaks, kill switch, and tunnel IPv6. You can also select the autostart within the settings. Be careful! The tab also holds advanced settings, tinkering with them doesn’t make you an experienced user but does spoil your VPN experience. Don’t have anything to do? Slightly tinker with Advanced settings and find out your heart’s content; get to know what are you doing. Mullvad has identical clients for Windows (Windows 7 or newer), Mac (OS X 10.7 Lion or newer) and Debian-based Linux; while OpenVPN configuration files for iOS, Android and, routers. Find and download the desired client or file with detailed manual setup guides available on Mullvad’s website. Mullvad does not have browser extensions, this might rob your convenience in one way or the other, but this is fair not to lull us into a false sense of enhanced privacy. Do you know the VPN browser extensions encrypt traffic of a single browser’s and not that of other internet-facing applications and other web browsers? Mullvad, being a big fan of the WireGuard VPN protocol, offers WireGuard setups for Linux and routers. The only deal-breaking point of Mullvad’s compatibility is unavailability universal OpenVPN mobile apps for your Android and iOS; which should be there. When troubled at initial sign up using an earlier version, we sent a bug report to their tech staff and the response was prompt and our problem was fixed immediately. As far as the latest version is concerned, contacting the mullvad is more accessible via client with less exposure to forbidding amounts of technical know-how. Click ‘view app logs’ and see the updates about what the VPN is doing. When contacted the support staff with a query about split tunneling, their response was quite slow; which is quite reasonable with other VPN services as well, as the team is more keen to answer fundamental questions about pricing and initial installation. Mullvad’s knowledge base offers two components: FAQs and Guides. For necessary information, refer its FAQs while for tech-related queries and instructions, scroll down their guides. Whether you’re a BitTorrent aficionado or a seasonal torrenteer, you still want your VPN to allow you P2P file sharing. Thank God, Mullvad allows torrenting coupled up with the unlimited speed, bandwidth, and data volume that creates Mullvad, absolute torrenting heaven. So, download torrents with no bandwidth limitations, and explore excellent streaming capabilities. You check also check our best VPN for torrenting guide to learn more secure ways to download torrent. Mullvad’s pricing is simple; pay €5 per month (approx. USD 5.99), and that’s it. If you’re looking for bulk-purchase discounts than you’re out of luck as Mullvad offer no discounts for buying extended subscriptions. Don’t be upset, man! You will get 10% discount if you pay by in Bitcoin. When it comes to a payment plan, we scroll down to know the availability of free plan; Mullvad offers a rather short, three-hour free trial to check their promises. Also, Mullvad also provides a 30-day money-back guarantee; only when you don’t pay by cash. Mullvad accepts credit/debit card (via PayPal), bank wire, Swish, and Bitcoin; you can also pay by cash and certain vouchers; this also keeps you anonymous. Mullvad with its idealistic mission to protect users’ privacy from prying ISPs worth giving a shot, keeping some North American competitors into consideration. Mullvad offers excellent security coupled with easy configuration, remain user-friendly for all the users, and yes, we ca n’t forget to appreciate the absence of the word ‘military grade’ on their website. With competitively priced topped-up with a well-designed interface, Mullvad only lacks “lightning fast” speed as compared to some other slower competitors. All in all, we’re giving Mullvad a decent spot in the list of useful VPNs and wish it Godspeed. Don’t forget to share your Mullvad’s experiences and thank you for giving it a read.